Quartzsite, a must see if you are a RVer, and that's where we have been since January 14th after escaping the rain in Borrego Springs Ca. If you have been following Pat'sblog, you know what we have been up to day to day, but she has left a few things for me to write about. So in a coconut shell, here they are. Before we left Yuma, I bought a plastic model kit to keep my hands busy. Starting with painting it, which some of that I have done along with some assembly, there is a lot more to do. And I would like to buy a couple of more colors of paint when we get back to Yuma next month. Not going to say what it is yet, you will have to wait until it is done. One of those chores that has to be taken care of while dry camping is, the dumping of waste tanks and taking on fresh water. There are a couple of different options to do this, one being to hook up and drive to the dump and fresh water stations or two, use a blue boy for the waste and a water bladder for the fresh water, we use the second method. 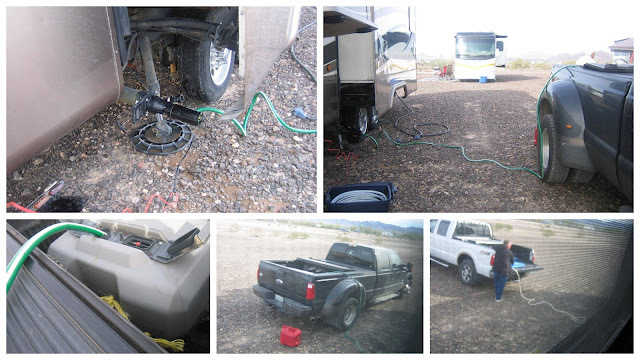 Top left - using our macerater to pump into the blue boy in the back of the truck. Rob and I worked together, as I have the blue boy (honey wagon) and we each have water bladders. While emptying our waste tanks, then Rob and Pat's, he used their water bladder to fill ours and theirs, fresh water tanks. A couple of trips each and a couple of hours and were good to go for a while again. Our Blue Flame heater wasn't burning even, so I had to take it apart to clean it. I found that across the burner tube there are slots where the gas comes out and burns. The end slots had a high flame, while the middle slots would burn with a low flame. After using an exacto blade to clean the middle slots, the flame burns clean and even across the burner tube. 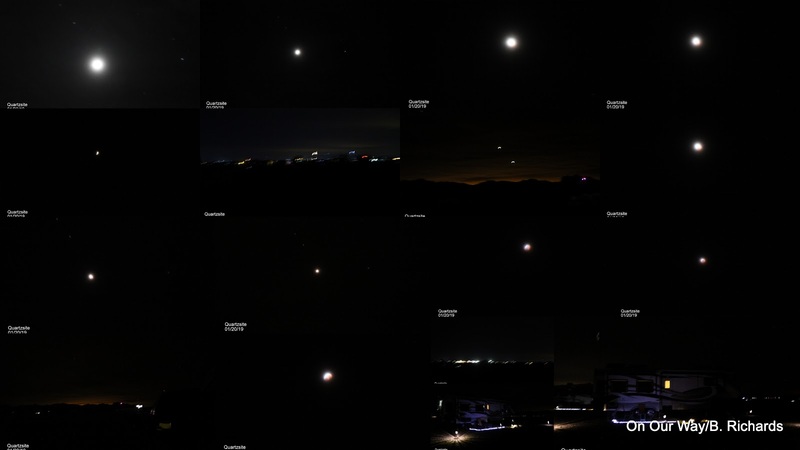 When the Blood Moon or eclipse was happening, I did try to get some pictures of it. Some of the pics that I took.The ones with the orange glow in the sky, where looking to the east. There are shots looking across the desert towards the town of Quartzsite and two of our trailer with the solar lights that we have out around it. For those that follow, I have mentioned that I fly radio controlled air planes. There is a club here in Quartzsite, Quartzsite Desert Flyers, with a flying field on the edge of town, provided by the town, who put in a paved runway, fencing, porta pots and a covered shelter. I was told that I could come and fly anytime, so next year, I will have to bring one of my planes with me. They also told me, that on Thursday evenings, they fly with lights on their planes, come on out and watch. So this past Thursday, Rob, Ken ( a fellow RVer camped next to us) and I went to see what it was like. 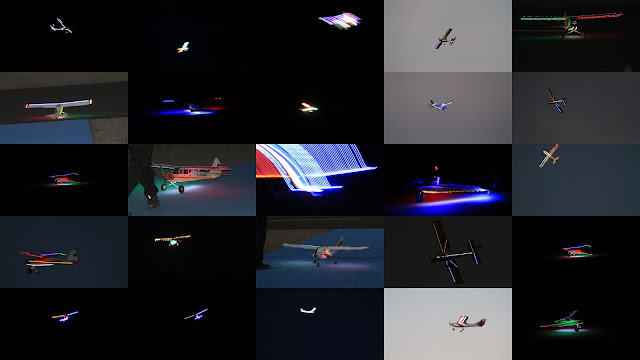 What a fun night, got some great advice on what led lights they were using and that one of my planes back home would be perfect for doing this. So, you know what I'll be doing before we come back. Fun to watch, can't wait to try it. There you have it, my coconut shell, thanks for taking the time to follow along. More to come on the plastic model and a hint of another model I bought and have to pick up on our way home. Until the next time, take care, be safe and leave a comment if you like. Good to see you found the Quartzsite parks. I've watched the night fliers a time or two myself. I Found the parks two years ago and hadn't been back since then. Glad I went back and found out about the night flying. Nice to hear from you again, and always busy as usual. Gotta love hanging out here in the desert. Thanks George, we do love hanging out in the desert. Those night flyers are cool...I used to fly my models at dusk with lights but we didn't have led's back then. Cool is right. We have guys back home who fly at dusk, but not as dark like these guys do. Can't wait to try it. So much in Q I never knew about. The flying field, the concert hall ... fun stuff for boondockers. Yes there is much to do. I am sure more than we know about also. I love your header picture! Those planes are awesome at night! Hopefully next year you can make room for at least one of yours. Thanks guys, the planes are awesome for sure. I'm going to do my best to bring one next year. I love to watch the remote control planes. I've been at night but I'm sure it would be very interesting. Teamwork with you and Rob makes the necessary chores go easier I'm sure. Always nice to have someone around that can help with those pesky chores. I"m looking forward to seeing your 'new' model finished. Keep on having fun Bill. I love to watch them too, but I miss flying them when I'm down here. I can't wait to try night flying. It has been great travelling with Rob this winter, helping each other out and making chores or repairs easy. Nice "coconut shell" catch up. I can never get the lights of Quartzsite in a picture, nice. Looks like it would be fun to see the planes flying at night. For someone who enjoys flying, as much as it sounds like you do, it must have been fun to watch. I think the trick for the lights at night is a tripod so that once you press the shutter, there is no movement. Certainly is fun to watch and can't wait to try it myself. You could come next Thursday night and see it first hand. Liked the Lighted Planes you were telling us about. I can just Imagine what your's will look like when you get it finished. Be Safe and Enjoy your model. Hope to do one up right for sure. They fly at night on Thursdays if your interested in watching it. I am VERY, VERY curious to find out what plastic model you're building..... Is it an Airfix 1/72 scale...? Wait and see and no it's not. Hey Bill, what size blueboy are you using? I was thinking of a 42 gallon one so it would hold a full 40 gallon black or grey tank. I thought you had to be a club member to fly from that field. Insurance or something? Just saw this. Our blue boy is a 45 gallon one. Anyone who has their MAAC or AMA insurance can fly at the Quartzsite field, as it is owned by the city. If you want to join the club, membership is only $10.00 a year.